I probably shouldn’t have done it. The Tweeted response did absolutely nothing to elevate the national debate. But – Damn! – it felt good. And for just a few moments it took the edge off of my jagged frustration with Republicans in the U.S. Congress. Isn’t there a modicum of societal benefit in that? Social media has become the communication method of choice for hundreds of thousands of people for communicating with representatives and senators. Even presidents. Who would have thought, even five years ago, that people would be shouting “JACKWAGON!” at a sitting president of the United States. But these days it’s happening on Twitter every day. In the the sitting president’s case, dozens, hundreds, thousands… even hundreds of thousands of times daily. Oh, sure, “they” – whoever “they” are – still tell you to write a letter or an email, or at least call the congressional office, but more and more people are opting for the short, sweet and simple medium of Twitter. This is a good thing – it’s enabled and encouraged more people to get involved in the national debate. This is a bad thing – the simplicity prompts people to Tweet things they’d never have said on the phone or written in a letter or email. Then again, maybe that’s a good thing, too. We need more direct, honest communication in this country. A little snark from time to time never hurt anything, either. Not seriously, at least. 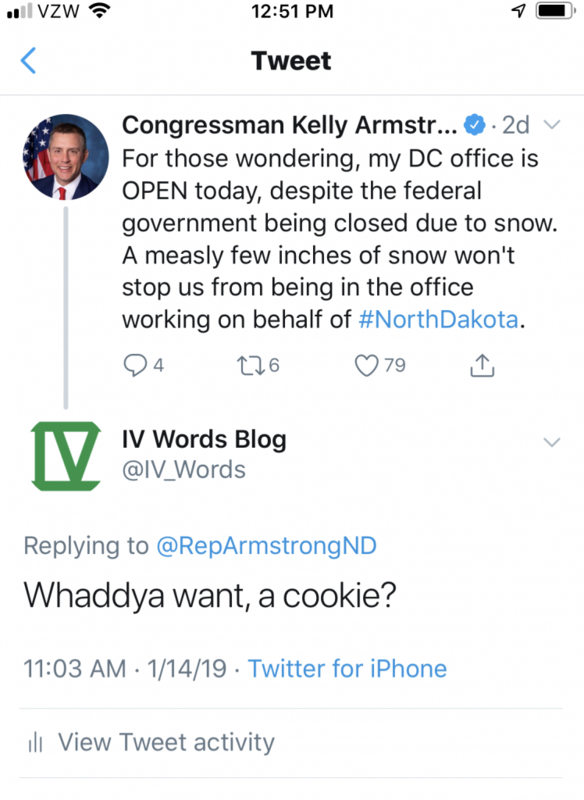 Kelly Armstrong is the newly elected representative from North Dakota’s at-large district. What’s that mean? Well, it means he’s all we’ve got. IV Words is not impressed. One of Armstrong’s first official actions was to pick up the Trump Talking Points and attempt to roast Alexandria Ocasio-Cortz (@AOL) on Twitter. The reverse roast from thousands of Americans was something to behold. I know, I know. Shouldn’t have. But Armstrong has been seeking attention, relevance and respect, obviously. I gave him a little of the former via social media. The other two he’ll have to earn for himself. 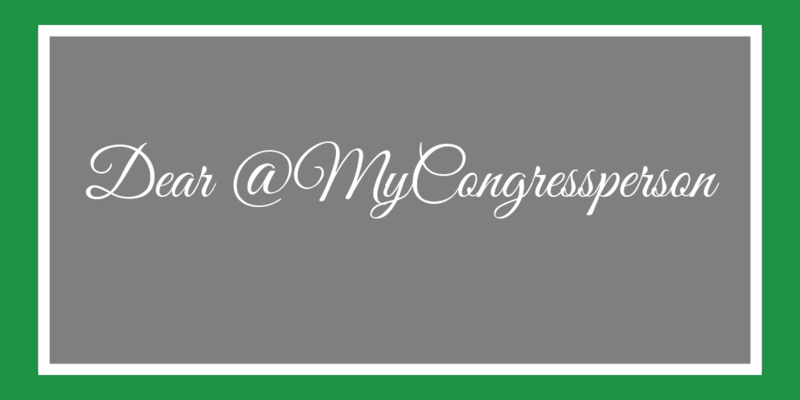 As you wait and watch, though, don’t hesitate to throw some communication at your elected representatives. Whether you use social or more traditional media, they need to hear from you. More importantly, you have a Constitutional right to let them have/hear it.